Micromosaics are basically mosaics that are made using tiny pieces of enamel – a substance that is very similar to glass. 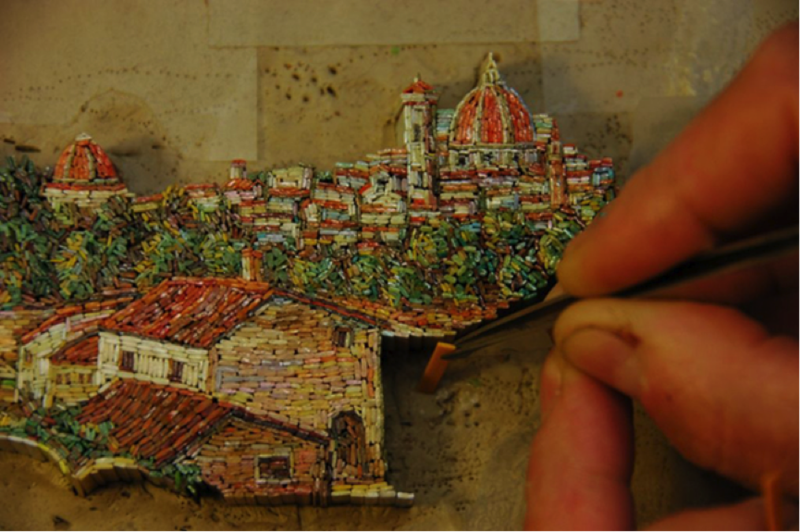 The small tesserae (mosaic pieces) often give the impression of a painting or drawing since the pieces are so tiny. The term itself was created by collector Sir Arthur Gilbert and the origin of micromosaics can be traced back to the beginning of the seventeenth century. During the year 1600, following the completion of St. Peter’s Basilica, interior paintings were becoming damp and decaying. To ensure that the paintings stayed in good condition, artists looked for a more lasting material and this is where mosaics came in. In order to reproduce the paintings, small mosaics made up of an opaque, non-reflective substance (Enamel) were used. The tesserae are usually oblong, in contrast to that of traditional mosaics, which are square shaped. A work can use around 3,000 to 5,000 tesserae per square inch. During the early 1800s, the city of Rome witnessed a sort of micromosaic boom: many commercial mosaic studios emerged and tourists that had just visited ancient ruins began asking for a micromosaic souvenir. Interestingly, the micromosaic most unique feature – the fact that the tesserae are not discernible to the naked eye – became the source of its eventual downfall. Tourists and customers could not notice the amount of work that went into the artwork and were reluctant to pay a large amount of money for it. And so, larger mosaic pieces were used by the Roman artisans to save time and money. In addition to traditional artworks, micromosaics were widely used by the Romans to create jewelry that was sold to Victorian ladies and tourists during the nineteenth century. These pieces of jewelry can still be found today.